The Traction Avant is one of the best-known Citroën designs of all time. Produced largely unchanged for over twenty years, it is instantly recognizable by most auto enthusiasts and it is not even all that rare considering its age. Some versions of the Traction such as very early models and convertibles are more sought-after than others, but the holy grail is indisputably the 22CV, a V8-powered super-Traction from the middle of the 1930s. The 22CV is not a myth and it was not just a one-off prototype, either. Citroën had clear intentions to mass-produce the car, a fact which is made evident by the numerous ads and brochures that were printed at the time. Engineers started designing the 22 after the 7’s and the 11’s development process had started. Citroën had been building cars for almost fifteen years and it decided that it had acquired enough experience to develop a luxury sedan that would stand apart from everything else it had built previously. The firm started with an 11 body and fitted it with a specific front end that included a longer hood, a bespoke grille adorned by an “8” logo, and headlights that were mounted flush in the fenders. The longer hood was necessary because the 22 was powered by a 3,822cc V8 engine that French magazine Auto-Journal identified as being made up of two 11 engine blocks fused together. The mill was rated at 100 horsepower, and it was said to use 16 liters of gasoline per 100 kilometers (14.7 mpg US / 17.6 mpg UK). Citroën initially planned on developing an automatic transmission with a torque converter for the car, but the unit was not ready in time and the automaker settled on a standard three-speed manual transmission. That was seen as a big setback, but the ambitious engine is perhaps what sealed the car’s fate. Engineers had a tough time fine-tuning it, and period reports indicate that it overheated, burned a large amount of oil and that the cylinder heads sometimes cracked. Furthermore, it only made 90 horsepower instead of the 100 planned. 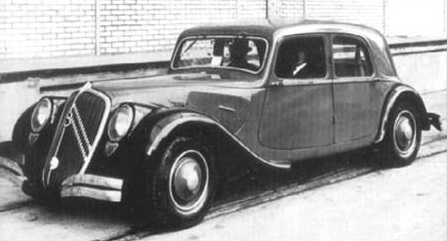 The car was scheduled to bow at the 1934 Paris Motor Show and the public was eagerly waiting for it; Citroën couldn’t push back the launch. As a last resort, the automaker installed a Ford-sourced V8 engine in the 22’s engine bay in order to put the finishing touches on the car’s suspension setup, brakes and aerodynamics. 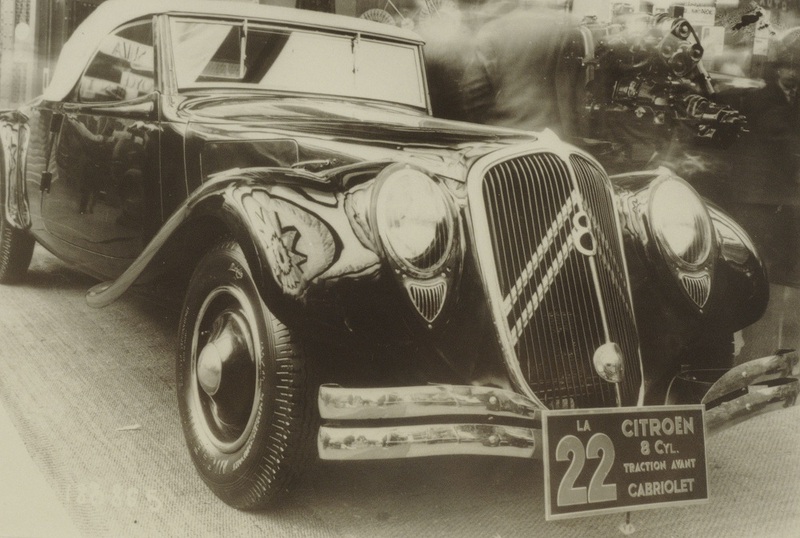 Everything went according to schedule and Citroën displayed the car in Paris in October of 1934. Three examples were on display: A regular sedan, a nine-seater limousine and a roadster. The V8 engine was not yet ready but an example of it was on display on a stand for the public and the press to admire. There are reports that claim that the show cars’ hoods were locked because they did not have an engine, but several photographs taken by show-goers prove that these claims are false. In Paris, Citroën did not mention anything about the delay in designing the engine. It distributed brochures that proudly stated the 22 would be available as a standard sedan, a limousine, a five-seater coupe, a three-seater coupe, a convertible, and what the company called the “faux cabriolet.” All of them boasted the standard Traction’s unibody construction and were front-wheel drive, two features that were exceedingly modern at the time. The 22 was billed as one of the fastest and safest mass-produced sedans in the world, designed for a wealthy and lucky elite few. Period brochures indicated that could reach 140 kilometers per hour (87 miles per hour). This was impressive but so was its price, which was far above that of the 11, the next model down in the lineup. In the middle of the 1930s Citroën was in dire financial straits and was faced with the dim prospect of shutting down entirely. The company was eventually taken over by Michelin in late 1934 and Pierre Michelin took the company’s reigns from founder André Citroën. One of Michelin’s first moves was to put an end to the 22’s development. The engine was close to completion, but the whole project was seen as a cash aneurysm for a brand that was already operating in the red. There are absolutely no doubts that Michelin cancelled the project, but what happened after that is a gray area in automotive history. It is estimated that about twenty examples of the 22 were built. Some claim that all of them were destroyed, while others say that only the 22-specific sheet metal was destroyed and that the cars were converted into 11s. In reality, both accounts are probably correct; some cars were modified, others were destroyed. It is easy to imagine that the story doesn’t end there. After all, Citroën officially destroyed every TPV prototype it built yet some were found hidden in an attic decades later. Do any 22CVs remain today? It is impossible to say with certitude. Many 22 sightings have been reported over the years but most have turned out to be a hoax. One of the most credible sightings is an example that is said to have been shipped to Vietnam (a French colony at the time) during the 1930s. In 1948, a dealership in Chartres, France, received a telegram from Vietnam ordering the parts needed to rebuild a 22CV water pump. The parts were not available and the sender of the telegram did not give additional information about the car, but a soldier stationed in what was then called Saigon reported seeing a V8-powered Traction with a big “8” on the grille driving around well into the 1950s. There are no known photographs of it, and its whereabouts are unknown today. Photos kindly provided by Citroën’s archives department. I’m not 100% on this, but I understand that Fabien Sabates- a well known Citroen historian- had said there was one located in northern France some years ago. Whether it was a genuine factory car or a well-placed fake, nobody seems to know for sure. I do know of one reproduction, but how faithful it is I have no idea. I’m rather surprised the factory hadn’t squirrelled one away somewhere, even if only a curiosity. Is the replica you know of the one by the de Boers in Holland? I believe that’s them, yes. I’ve only seen a few pics, I would really be interested in the complete story. Interesting – where are you getting your info from?